With the Sun in Jupiter’s sign Sagittarius, it’s about time to think big. After all, the hub of our local universe, the center of the Milky Way is in this wonderfully crazy and witty sign. 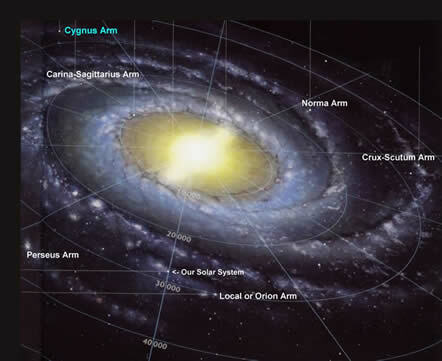 All the uncounted stars we can see by naked eye circle around this universal hub, they’re all part of our home galaxy. 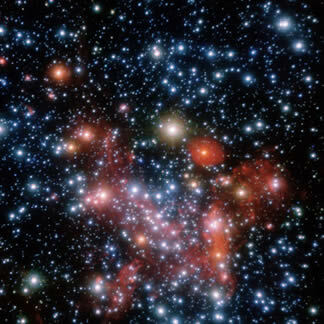 Scientists estimate the population of our cosmic village to exceed 400 billion stars. Our solar system is somewhere in its outer fringes, and for 26,000 years the light from the galactic core has been on its way to bring us a galactic message. The Galactic center (GC) was discovered in 1932 by Karl Jansky, a Bell Telephone Labs engineer. He set out to find the source of static noise affecting overseas telephone lines. In his pursuit he built the first 95-ft. movable radio-telescope. He soon realized that electromagnetic waves emerging from the center of our galaxy were responsible for the static noise. Only in the late 1960s did astronomers begin honing in on the GC. They found a huge black hole, the size of a large star, hiding at the galactic core. With a mass of approximately four million suns this black hole generates a colossal gravitational field holding our Milky Way together. Astronomers say that our solar system is rotating around the galactic hub at a breathtaking speed of 135 miles per second, completing one full round every 250 million years. From November 21 to December 20, the Sun is in Sagittarius. It’s the time when days still are getting shorter, when darkness is threatening to take over. Ready to explore the depths of the underworld, the Archer is a great adventurer, excited to travel to the outermost edges of the universe. While the Sun was in Scorpio, plants and trees pulled their juices back to their roots, all visible signs of life vanished. In step with nature around us we’re invited to enter the spirit world. This is the time to give thanks to Earth and Sun, and celebrate the many wonderful gifts received. Work is done; harvest is in. Our cellars are full of preserves and stacks of firewood are piled up to sustain us on this journey into the dark. This is the time to descend into the inner universe, to read and write, study and explore. Sagittarius is the sign of the philosopher. It teaches us that dark and difficult times eventually bring depth and understanding. One has to get involved, willing to come along into the unknown. It’s during darkest nights when mysteries and secrets are revealed. Nothing can surpass the overwhelming experience of standing under a bright canopy of countless stars, surrounded by millions of sparkling ice crystals, mysteriously amplifying the fragrance of deep space. When gazing into bottomless space we are reminded of our universal nature, that the infinite cosmos is our ultimate home. So this is the time to dream, think big, envision and plan. No project is too big, no idea too lofty to be taken on. In some ways or other we’re meant to be daredevils and utopians, thinking of six impossible things before breakfast, as Alice in Wonderland does. With patience and pure intentions, manifestations will begin falling in place. Do whatever is in your power and leave the rest to god. With such a mindset you will be at the right place at the right time. A most interesting detail of what’s happening in the outer world at present is the devaluation of precious metals. Gold in particular always has been perceived as the ultimate material value. This breakdown might be the first indication of a larger change in our human value system. The world has undergone immense shifts in the last 20 years alone. If there’s anything remodeling society, it’s the Internet. It’s impossible to gauge the evolutionary potential this invention is holding, and we’ve just seen the beginning! Pretty much everything in our world is changing from ground up. It appears that one step at a time we’re moving away from accumulating unnecessary material possessions. In the face of innumerable looming global threats we might come to realize what true human values are. There’s no question, we still will need basic necessities like food, clothes and shelter. But that’s it. What’s of real value comes without a price tag, hence money might start losing its lure. There’s a growing trend of caring for one another. Again, the Internet is the vehicle encouraging this process. People are offering support and sharing their knowledge, helping those in need. It’s the nature of difficult times that we come closer to one another. Contribution becomes more important than competition, simply because it makes us happy. The Internet is our global brain. It takes many years for the child’s brain to fully develop. Stimulated by the environment, individual brain cells begin linking up with each other, building a complex network. Research reveals that loving attention and gradual exposure to the world boost the growth of brain synapses. Music, most particularly the sound of string instruments, strongly increasing the number of dendrites. The more connected brain cells are, the more intelligent a person is. So it’s pretty obvious, the more connected we are with each other, building circles of friends, forums and communities, the more intelligent our human species is becoming. We therefore are encouraged to publish our thoughts and communicate with anyone on this planet. Already now, any information is at our fingertips, and by participating we help increase the body of knowledge. Individuals, governments and corporations alike have learned that there are no secrets any longer. Everything is bound to come into the open, which basically is a good thing. The bottom line is that we all will have to become more accountable, individuals, corporations and governments alike. And with a growing transparency there will be less room for manipulation, abuse and all sorts of shady undertakings. 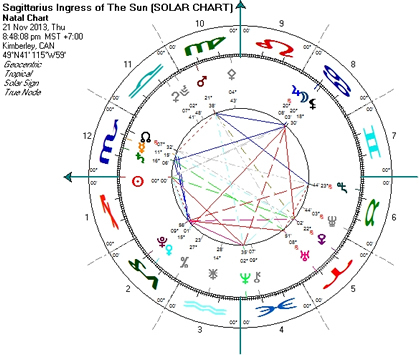 The day starts with Moon in Virgo opposing Neptune. Healing is the main theme; we are receiving the information we need. We’re able to absorb and soak it in. Breakthrough is achieved when we understand that we are our own best friend, that nobody is neither entitled nor able to change our situation. Accept help, show your gratitude and follow through on your task. The Cosmic World Bridger is the ultimate day of the Wizard cycle. You may be aware of it or not, today we’re standing between the worlds, one foot here and the other there, and it’s our obligation to share the good news. Innovation is the word of the day. There’s a multitude of ideas swirling around. Catch them, take notes, make plans and dare to do things in new ways. Every creation begins with an idea, a dream, a thought. Dare to be bold – this is the time for it! As mentioned in last week’s forecast, today’s cosmic energies are all in favor to initiate new projects, to set out manifesting your dream. The Virgo Moon is void-of-course ’til 3 p.m., so take things as they go, be ready for delays and temporary disruptions. There might be some upset you have to deal with. Keep to the facts, make it a point not to get carried away by emotions. In the later afternoon and evening, under a Libra Moon, everything will pan out nicely. This evening could make for a successful social event. Dedication and focus to work out details are at hand. This is Comet ISON’s big day. If it survives its close encounter with the Sun we will soon be in for a great show! (check for latest updates). The Red Electric Moon may trigger strong emotions. Own them, embrace them and use them in constructive ways. Emotions are our most powerful tools; they have much greater impact than words alone. The Libra Moon is void-of-course for the entire day. Venus and Jupiter are exactly 180 degrees apart, aligning with the Black Moon, the Lunar apogee. The two points where the Moon is at closest and farthest distance from Earth are a cosmic junkyard where unprocessed and difficult emotional energies are piling up. The chances are that we might have to deal with some confusion, or a situation that has gotten out of hand. It’s always helpful to remember that things happen when they’re meant to happen. Knowing that this is the cosmic setup we may take things less personal. The Moon is in Scorpio in its balsamic phase, two days away from New Moon. If you’re up early you might get treated to a slender crescent hanging low over the Eastern horizon. Scorpio Moons tend to be intense and profound. This one could prove particularly resourceful as it’s at the end of a 30-day cycle, seasoned and ready to release deep insights. The Blue Overtone Monkey adds a playful and witty note and may be up for surprises. One day before New Moon a calm is setting in. When the winds have died down the lake becomes a mirror. The celestial energies mentioned in Friday’s forecast are still in play, so be ready to deal with excess and situations that have gone out of bounds. The Yellow Rhythmic Human adds compassionate energy. There’s readiness to accept solutions and the openness to receive help. We’re in this together; it’s not about blame but about being responsive and responsible.